Client Spotlight: Quanergy at CES 2018 | Absolute Exhibits, Inc. The Consumer Electronics Show (CES) is the world’s largest exhibition of consumer technologies. Serving as the proving ground for innovators and breakthrough tech for 50 years, CES is the largest hands-on event of its kind for manufacturers, developers and suppliers within the consumer technology markets. CES gathers more than 170,000 attendees from 150 countries around the globe and over 3,900 exhibitors from a wide range of product categories, including automotive, health and wellness, internet of things (IoT), artificial intelligence, eSports and more. 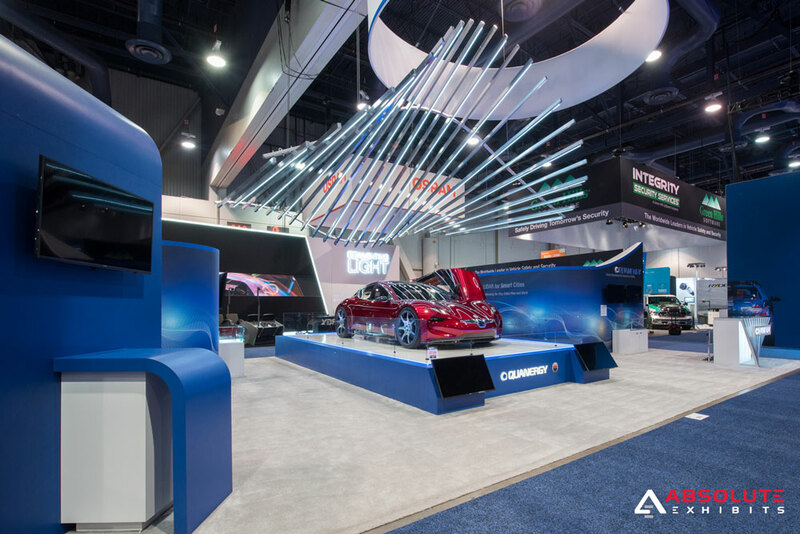 For the third year in a row, Quanergy Systems Inc. (Quanergy) partnered with Absolute Exhibits to build a 30’ x 50’ custom exhibit for CES 2018. Quanergy planned to showcase its revolutionary S3 solid state LiDAR sensors and host the world debut of the Fisker EMotion, a luxury autonomous electric vehicle that utilizes the S3 sensors. Needless to say, it was important for Quanergy to have an impact at consumer electronics’ largest global stage – and our team was up for the challenge. Founded in 2012, Quanergy has quickly proven itself to be an industry leader and innovator with its solid state LiDAR sensors and smart sensing solutions for the industrial automation, mapping, security and transportation markets. In the automotive space, the company’s cutting-edge LiDAR sensors, which were first introduced at CES 2016, are utilized in vehicles to enable advanced driver assistance systems (ADAS) and autonomous driving systems. Five Quanergy S3 solid state LiDAR sensors, winner of the 2017 CES ‘Best of Innovation’ Award, were featured in the elegant, new Fisker EMotion. 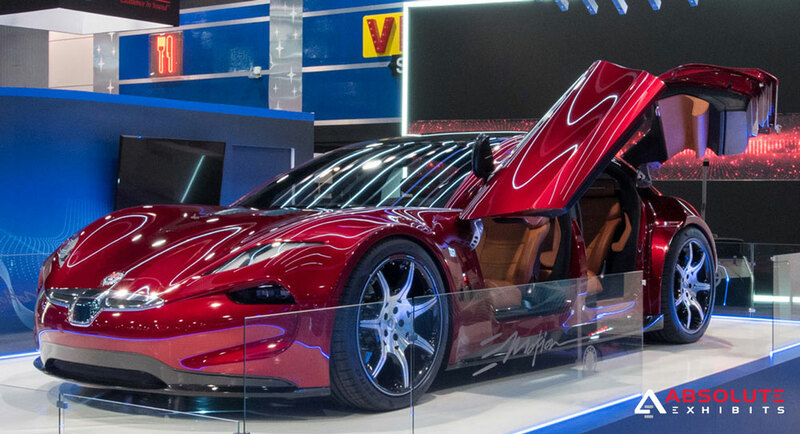 Absolute Exhibits was challenged to create a high-end, functional booth space to showcase Quanergy’s new and innovative S3 sensors, as well as compliment the unveiling of Fisker’s first all-electric autonomous vehicle. Starting with the focal point of the booth space, our team incorporated a raised stage to showcase the Fisker EMotion. The stage was surrounded by glass partitions with frosted and 3D backlit Quanergy logos, blue LED accent floor lighting and 40” LED monitors to display a live demo of the sensors in the car. “I love working with Ann and the entire Quanergy team because they continually strive to improve and push the boundaries, which makes the entire creative process that much more exciting,” said Michael Pino, Senior Account Executive at Absolute Exhibits. A custom statement structure made of aluminum beams with built-in white LED lighting was suspended directly above the vehicle to further draw in attention to the booth’s focal point. Just above the unique structure was a rotating 16’ hanging sign with Quanergy branding. On each side of the vehicle were custom private meeting spaces with full wall graphics, wall-mounted monitors and frosted privacy glass windows with clear cut logos. The Quanergy booth at CES 2018 was a tremendous success and the company received a great deal of press from several online outlets, including Forbes, Mashable, Wired and The Verge. “Best CES ever,” said Ann Gargiulo, Senior Director of Marketing Communications at Quanergy Systems, Inc.
For more information about this project or to receive a quote for a trade show exhibit rental, please contact Michael Pino at (714) 685-2852 or email mpino(at)absoluteexhibits.com.